Now, we are really on our way. 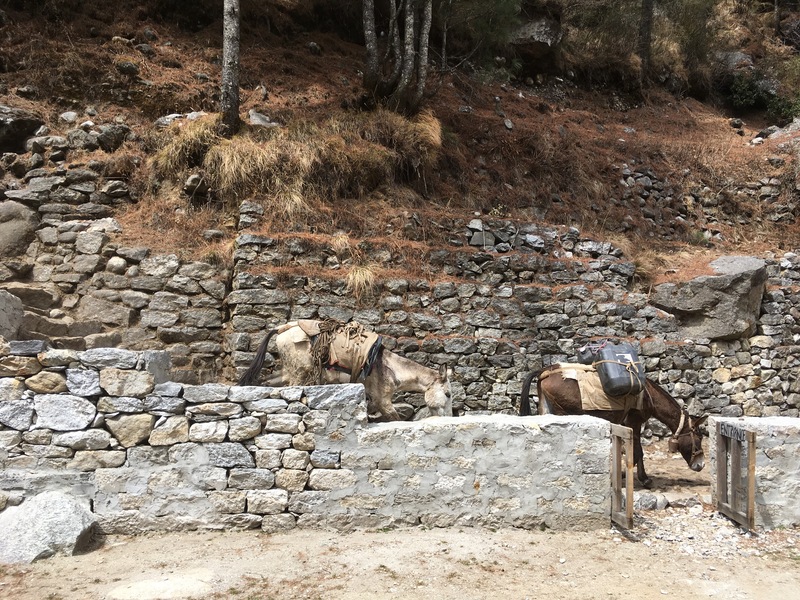 The trekkers pour into Lukla. 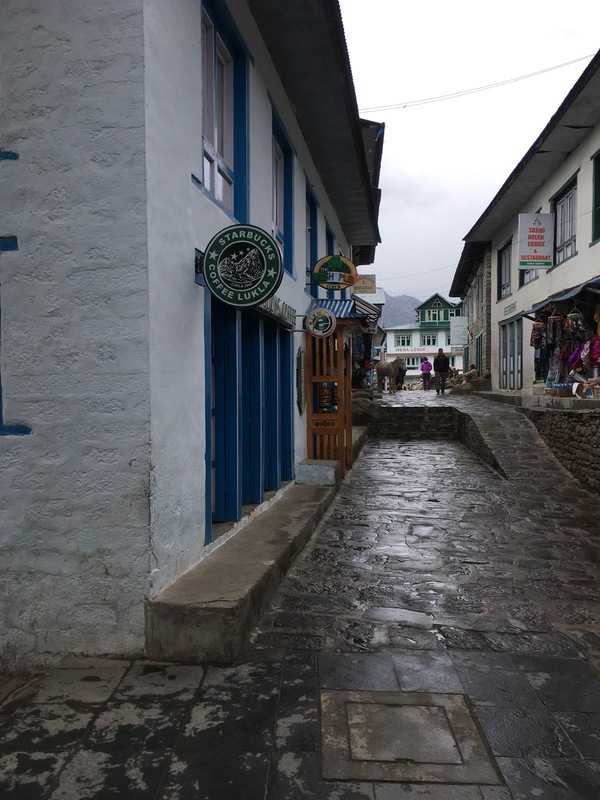 In the morning, we sit in cold wicker chairs in the sun room of Lukla’s Starbucks (Starbucks! ), charging our iPhones and drinking cups of Americanos and sharing banana and chocolate muffins. 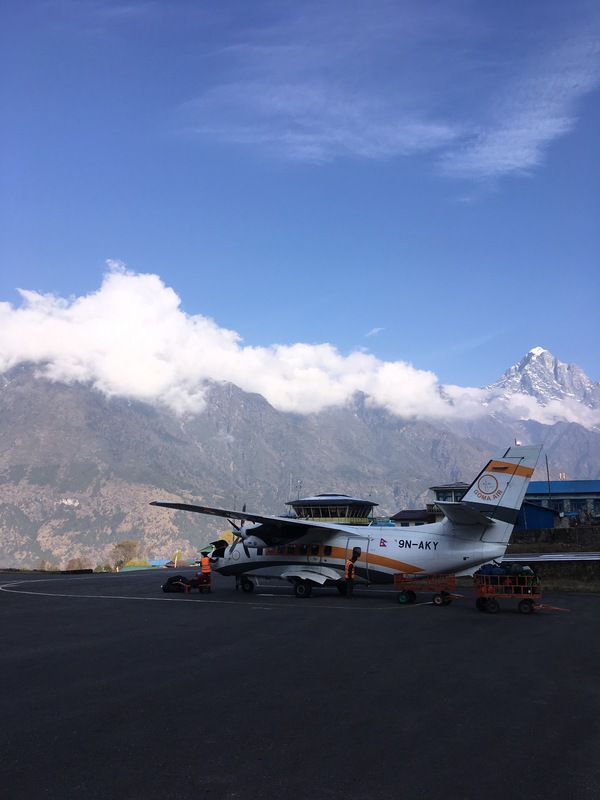 In and out of the front doors come the trekkers who’ve flown into Lukla from every corner of the world to make the pilgrimage to Everest Base Camp. 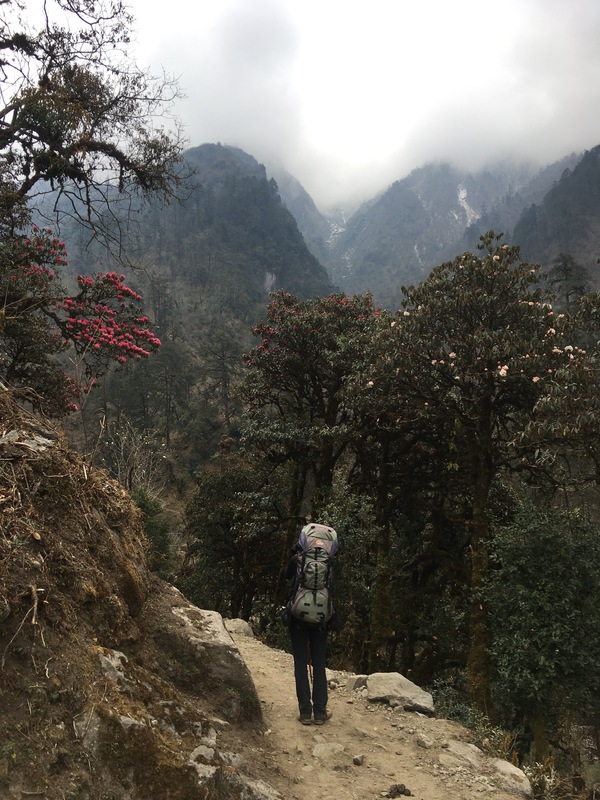 On our hike from Lukla to Phakding, they clog the trails with their trekking poles and bright Western backpacks and huge floppy hats. 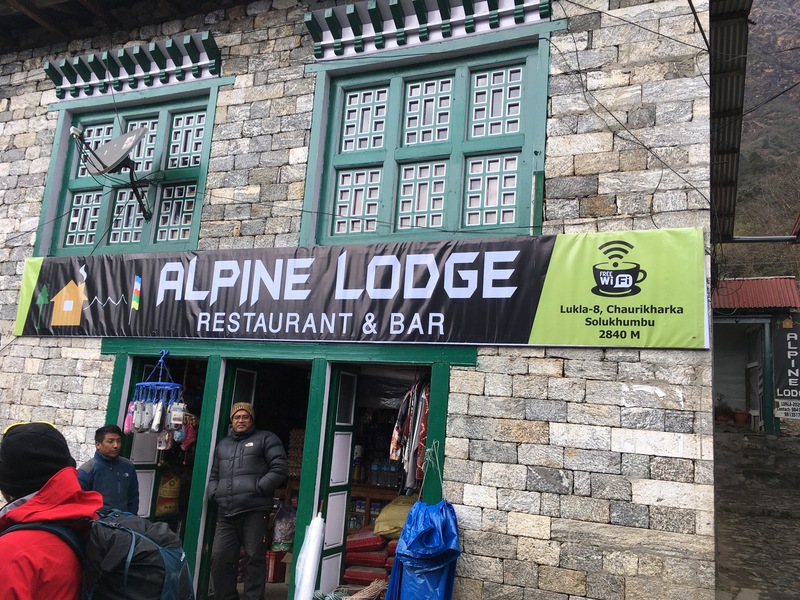 That evening, we sit around a hot stove eating momos and rara noodle soup, talking with trekkers from Israel, Belgium, and India. 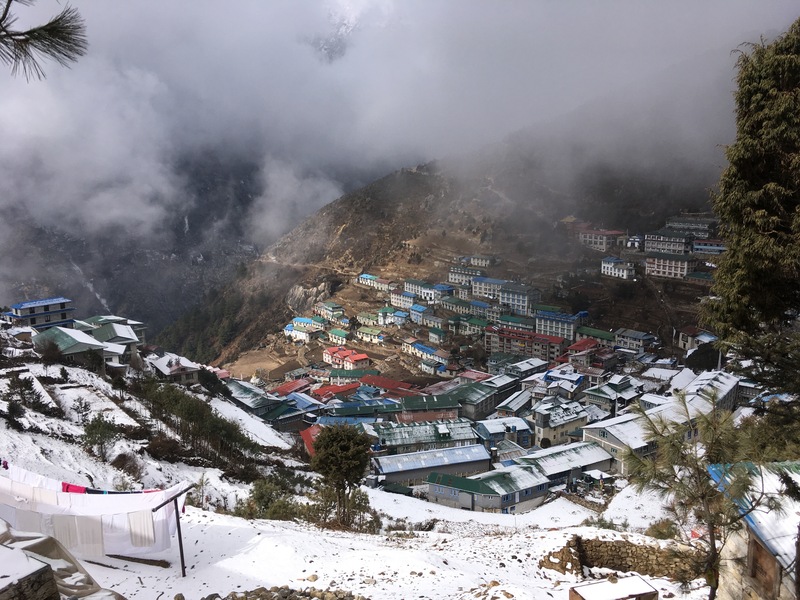 The next day, in the bustling Himalayan town of Namche Bazaar, we wade through throngs of trekkers buying Sherpa gear and toilet paper and Oreos and Himalayan souvenirs, in search of our own list of trekking supplies. That night, a group from South Korea floods our lodge, bringing their own food up the mountains on the backs of yaks. 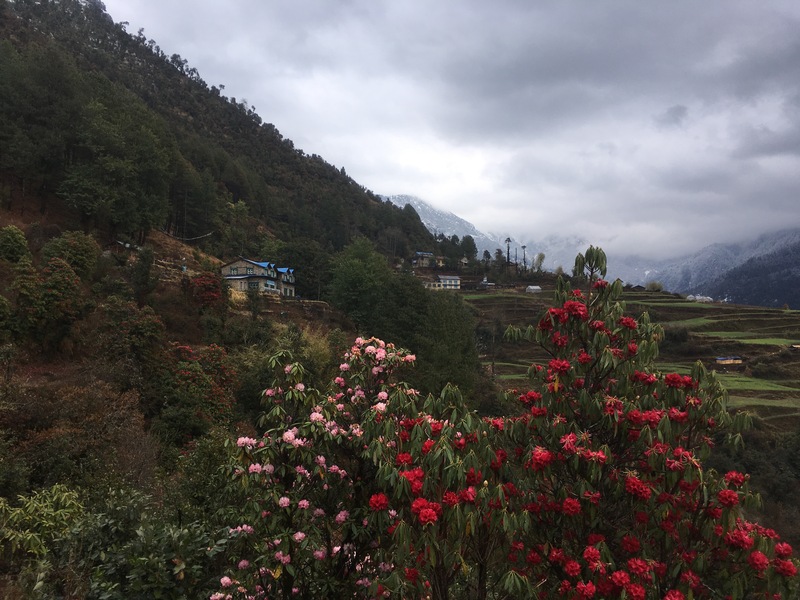 I miss the rural countryside from the first half of our trek. 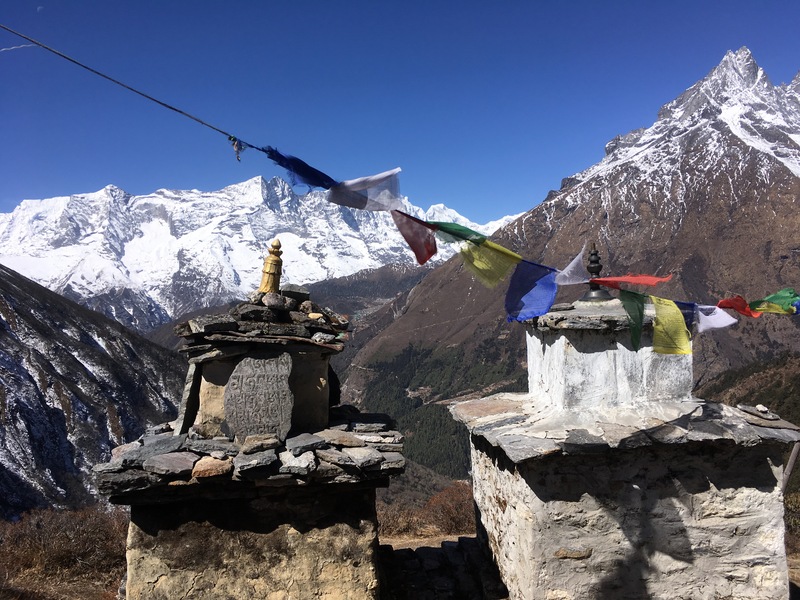 In Tengboche, our next stop, we hike for a while down an icy path twisting through mossy, gnarled pine trees with two older hikers from Ohio and New Zealand. 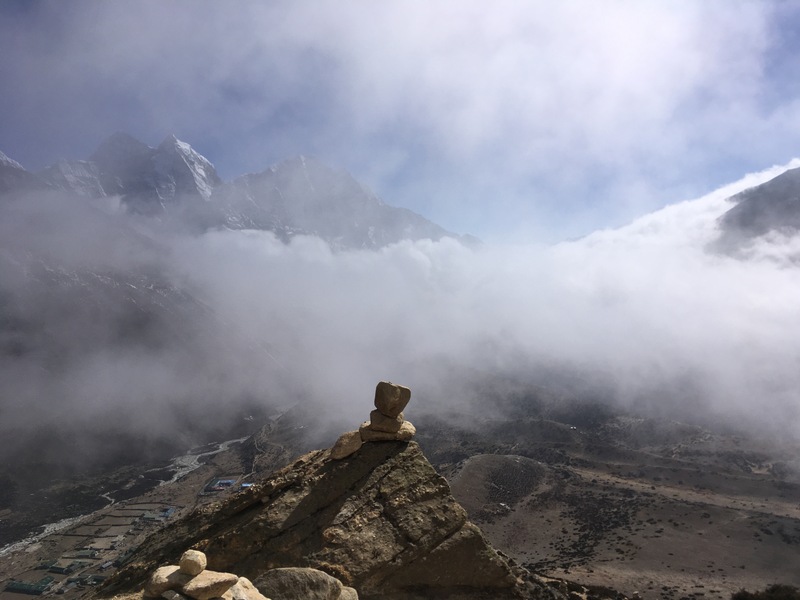 When we tell the man from Ohio that we hiked all the way from Shivalaya on the original path to base camp, he is visibly impressed. It gives me a sense of satisfaction and accomplishment. 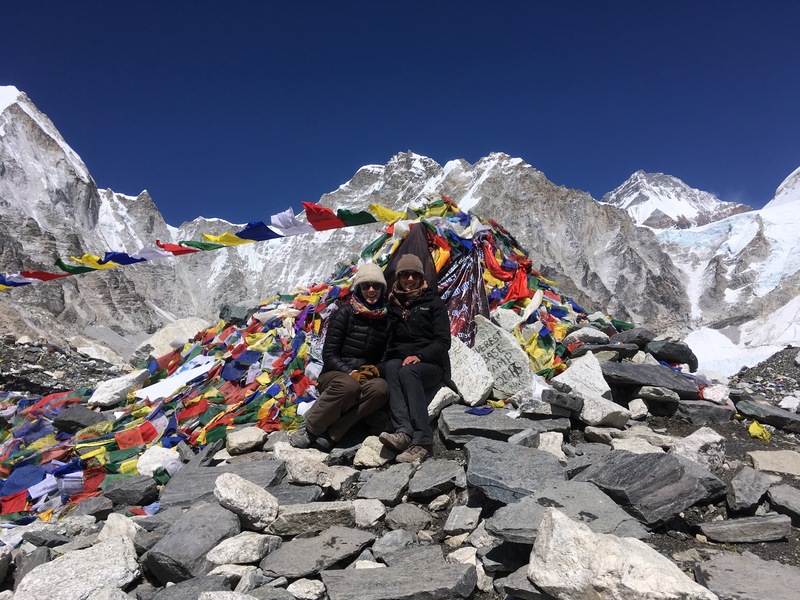 Of course, the two German trekkers at our lodge in Tengboche don’t know we made this hike, and they laugh at Emma and me, clearly thinking us two inept girls who can’t get out of our cold beds for breakfast in the morning and need hot water bottles to sleep at night. 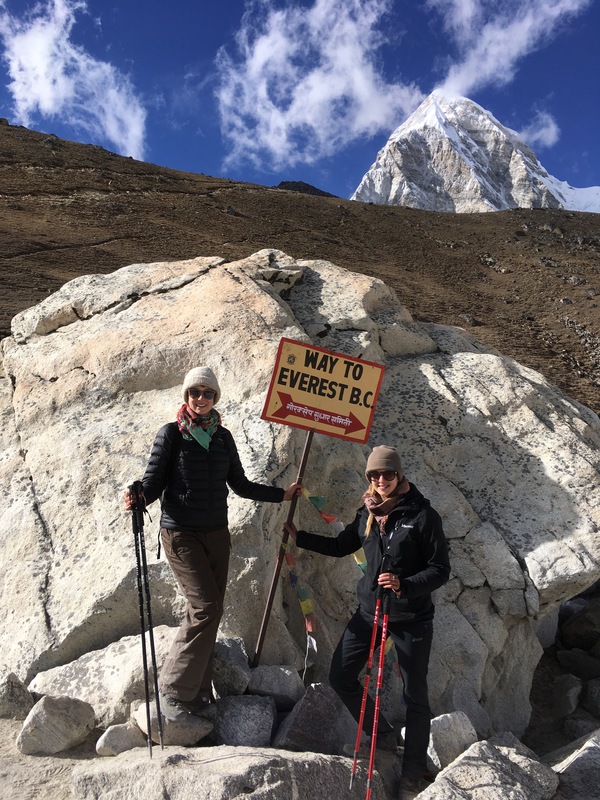 A veteran Italian trekker turns to our German trekking companion. The Italian laughs. 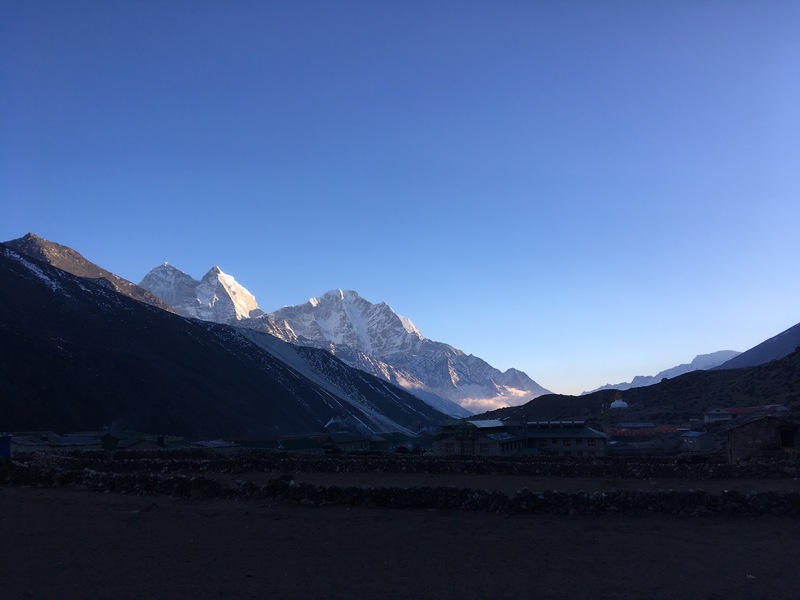 Emma and I don’t care; we are happy to wake in the morning to clear blue skies and a perfect view down the valley to Mount Everest. 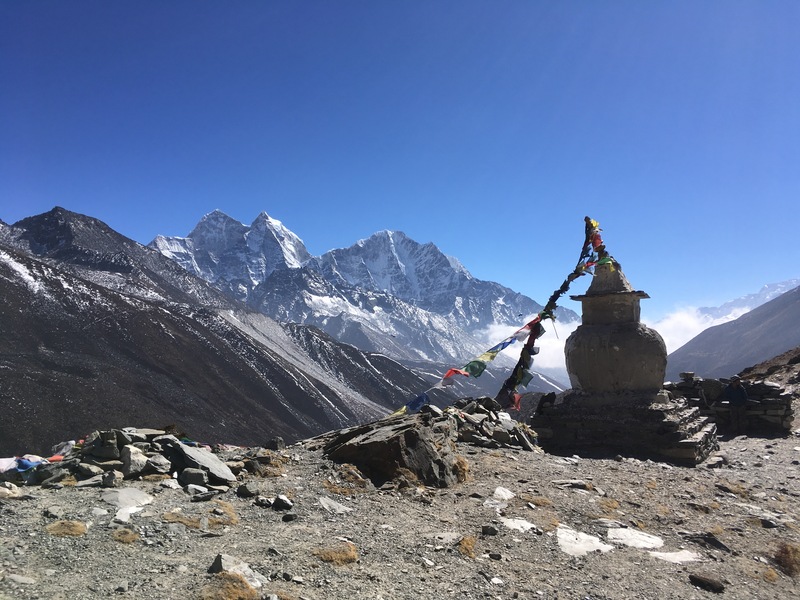 Now that we are on our way and the terrain is flatter and my knees are healed and the end is in sight, it’s tempting to think the difficult part is over. 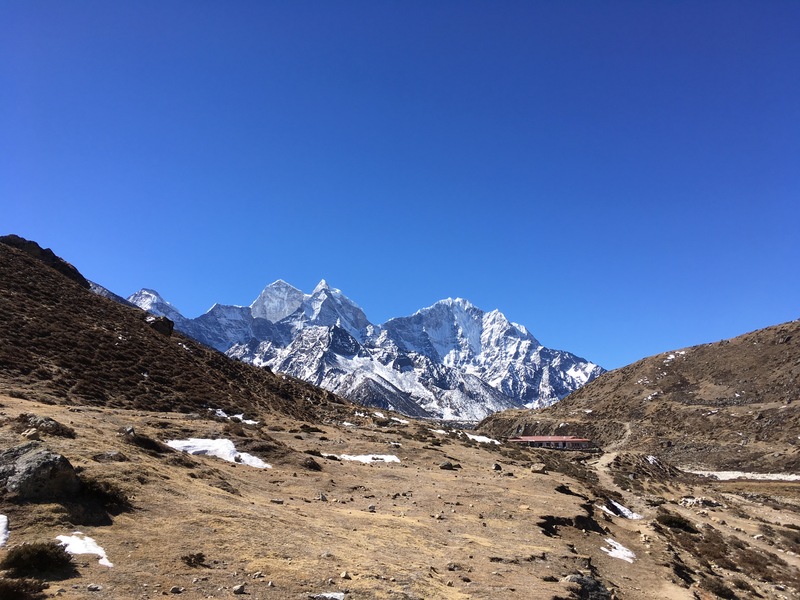 But though we no longer hike for eight hours over steep mountains up 3,000 feet and right down another 3,000, there are other challenges. Mainly: the altitude. 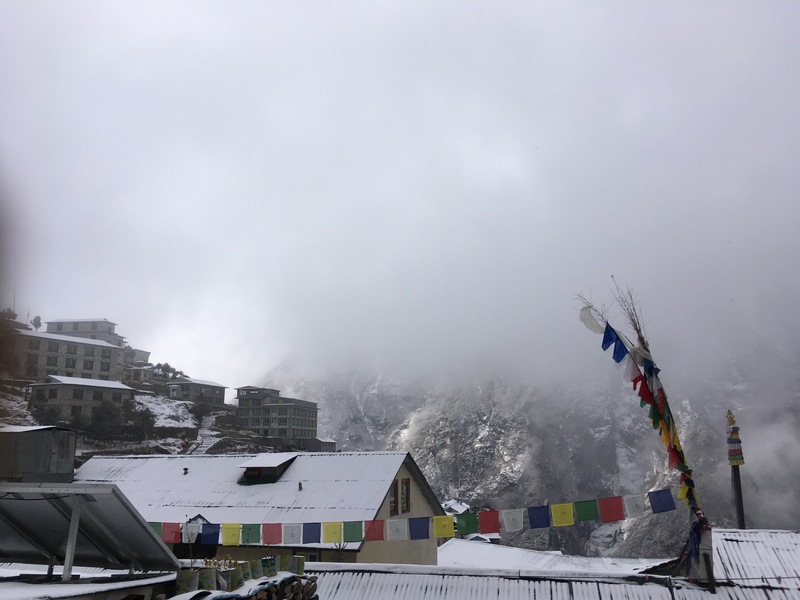 I first feel it in Namche Bazaar, when I fall asleep with a dull headache and wake in the morning with it still right there in the center of my head. I drink bottles and bottles of water from my plastic blue Nalgene. 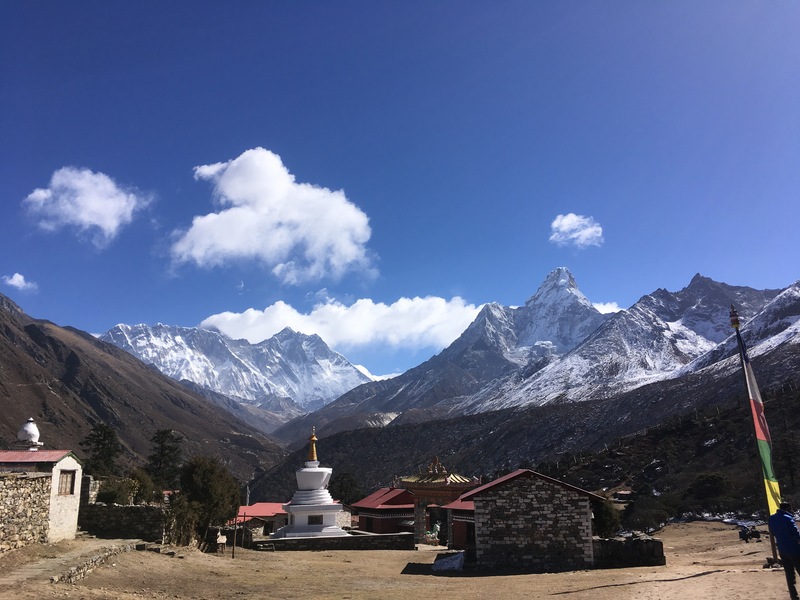 When we leave bustling Namche for quiet Tengboche higher up, I feel the altitude in my lungs; I am easily winded, my lungs don’t feel big enough to contain all the air I need, my heart begins to pound. 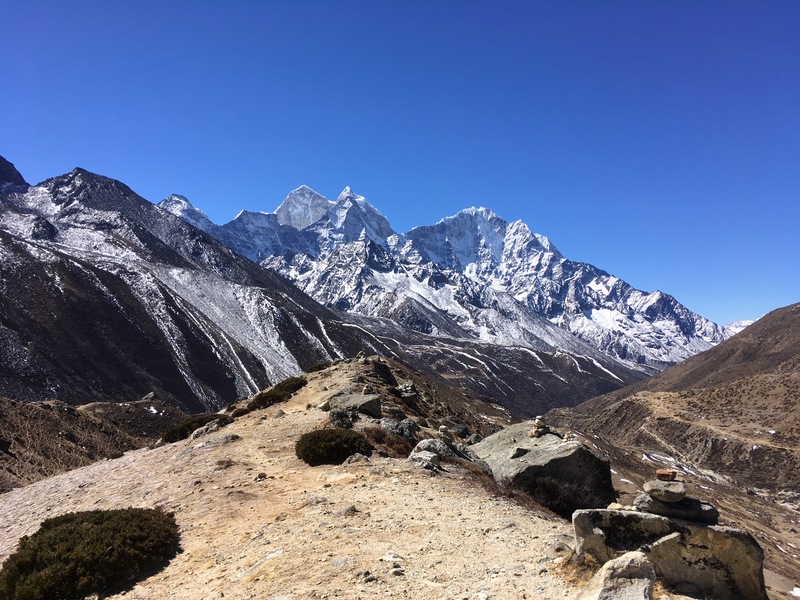 On our way higher from Tengboche, we run into two German trekkers who walked part of the way with us from Shivalaya. They were faster, and are now on their way down. 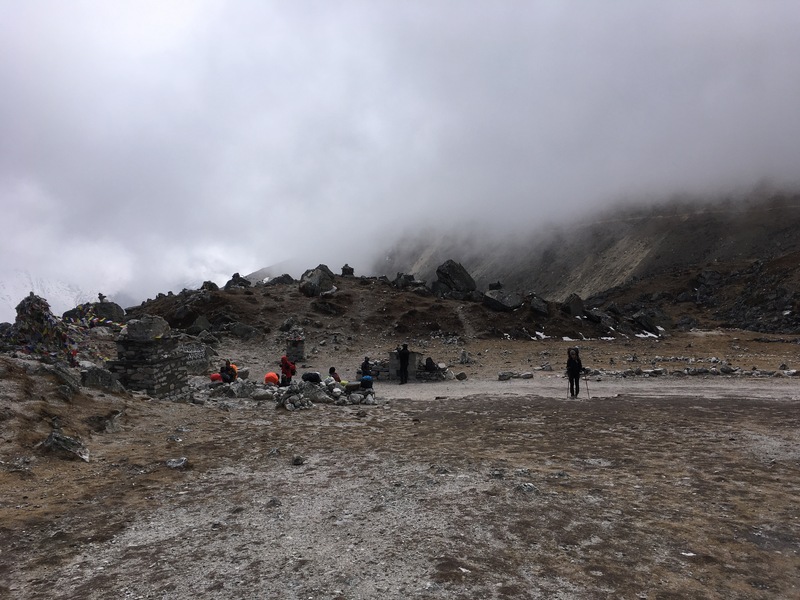 They did not make it to base camp, though; they had to turn around one village away because they couldn’t breathe. 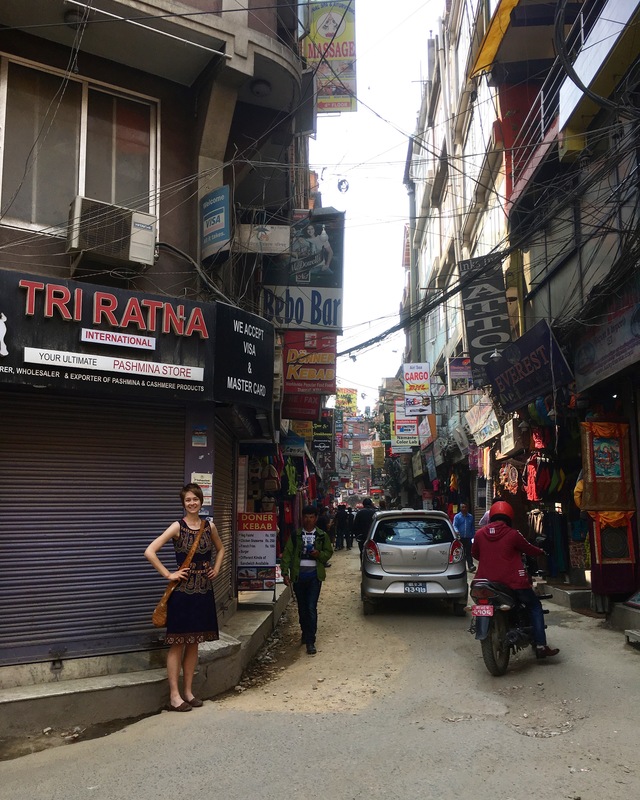 A little farther up, we run into the Finnish and Northern Ireland fellow who took the bus with us from Kathmandu. They are also on their way down. The Northern Ireland fellow made it to base camp, but his Finnish friend did not; he became ill by something he ate only one stop away. 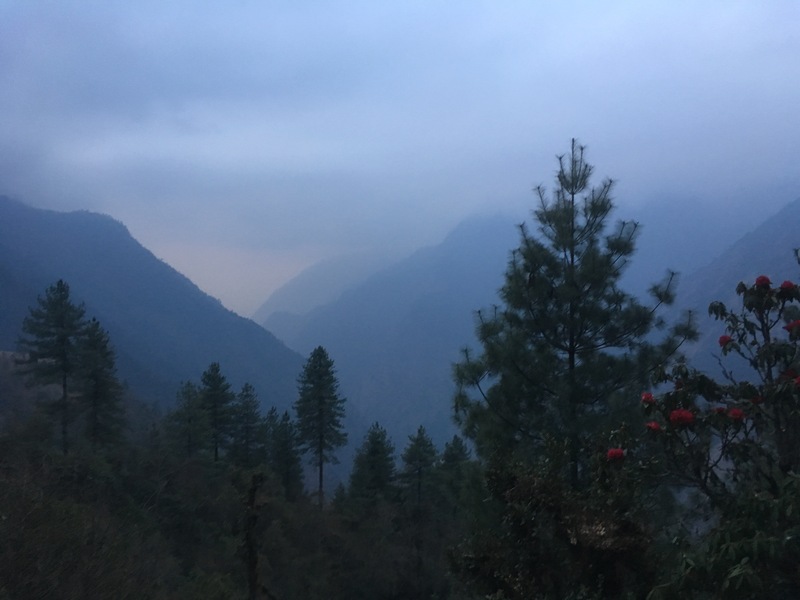 That evening, we stay at the village of Pheriche in a shaded valley in the high mountain desert. 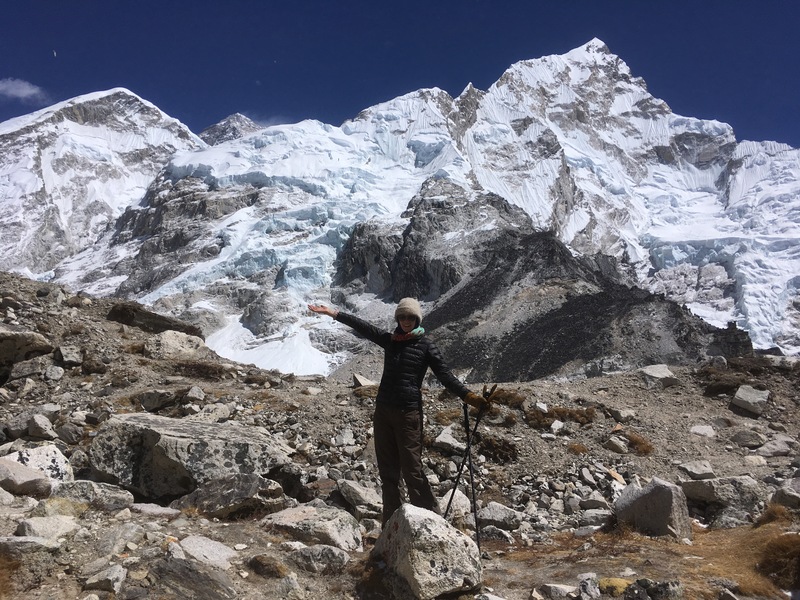 The other lodger who stays with us is a young woman from Paris, on her way down from base camp. 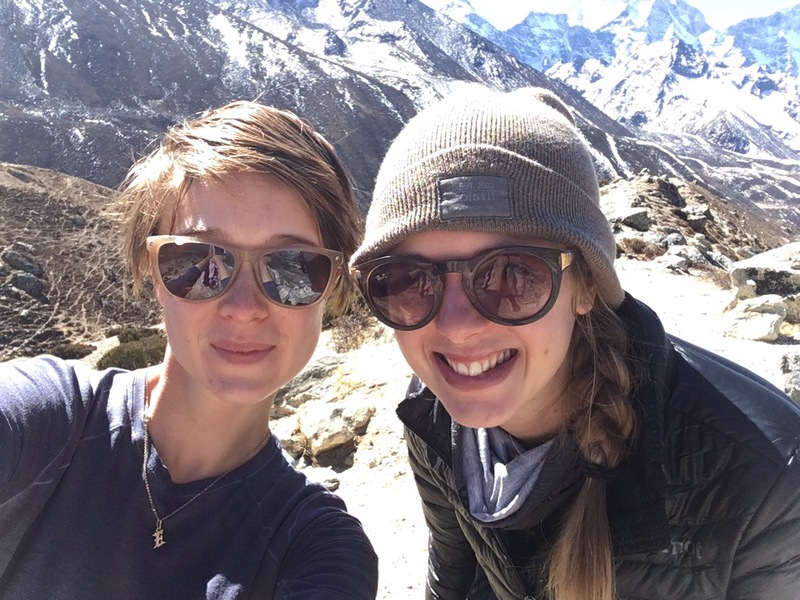 We talk with her around a warm, rusted stove fueled by dry yak dung and kerosene. 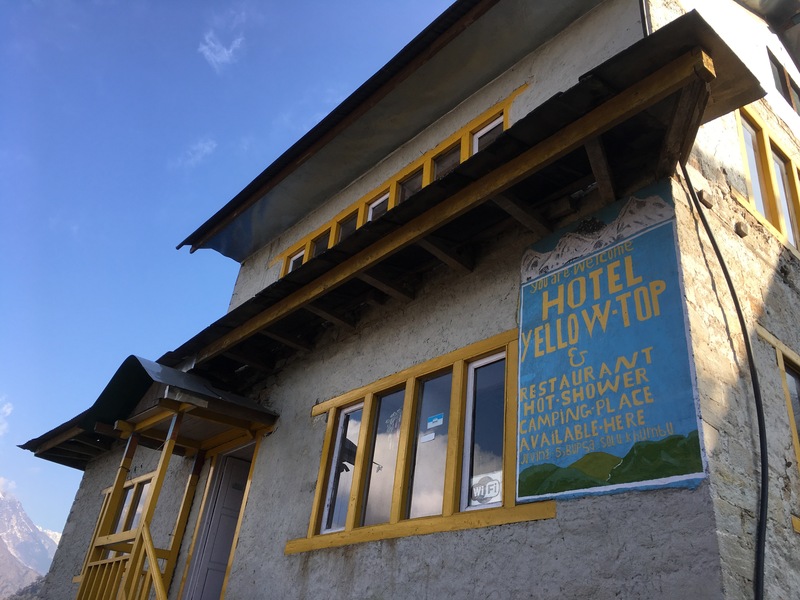 The slate gray mountains shine in the late evening sun out the lodge’s wide windows. 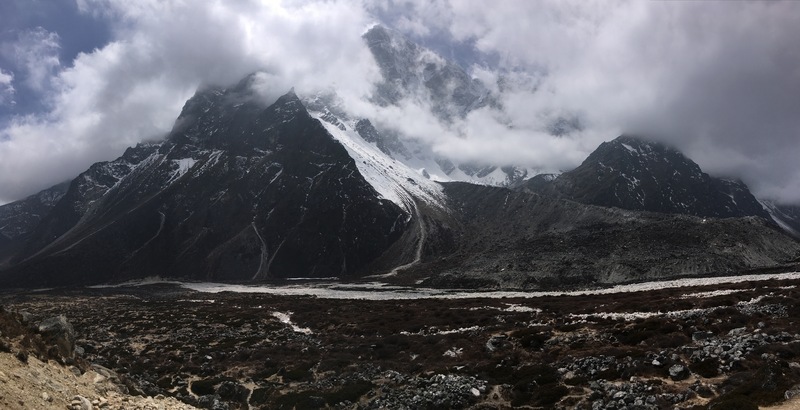 Wind blasts down the valley over the rust-red moss clumps and dull brown earth, stirring the iridescent river and swirling the white caps on the tips of the sharp peaks. We are now in the high mountain desert, a barren desolate land that harkens back to something primordial within me. 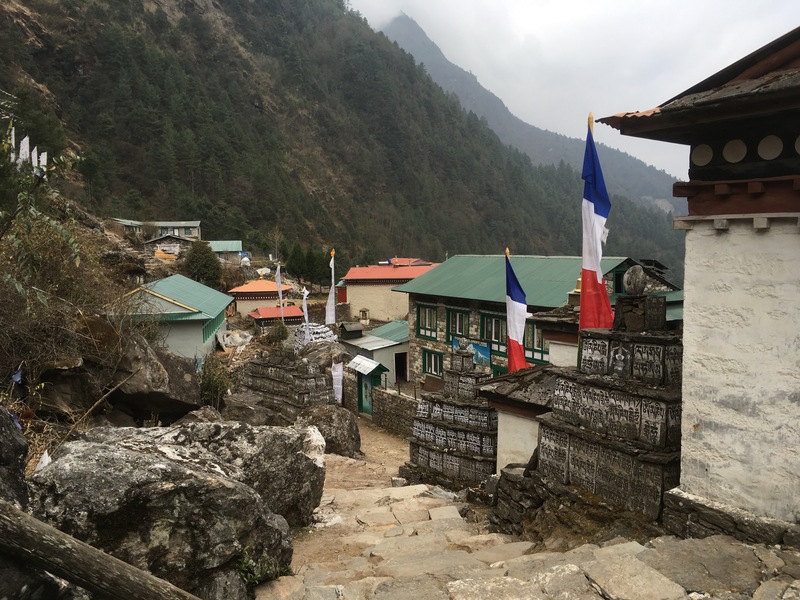 The Parisian woman tells us that her friend from Spain suffered for three days in Pheriche on the way up, her lungs screaming for air, her head split open down the middle by the lack of oxygen. 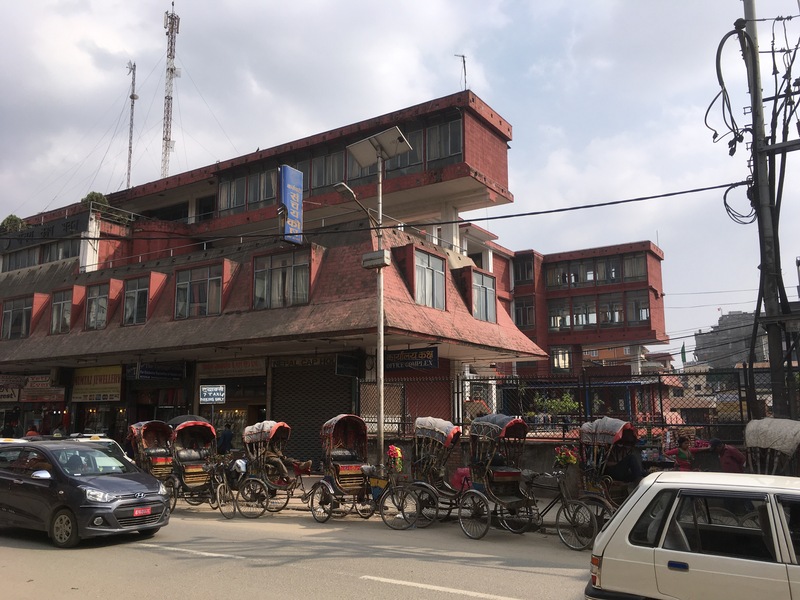 In the end, even after the extra acclimatization days and a hefty dose of the altitude sickness medicine Diamox, the Western doctors at the clinic in Pheriche send her home. She is devastated, the Parisian woman says. She was fit enough and spent so much money to get here, only to turn back. Even having come this far, making it is not guaranteed. Now, we are only a few nights away from our destination. 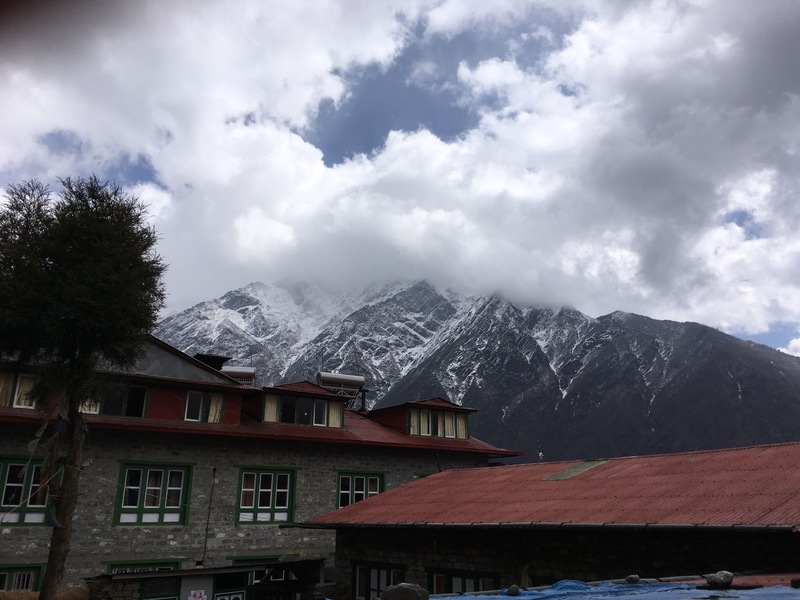 We have walked and walked and walked, and seen so much beauty, and felt so much pain. 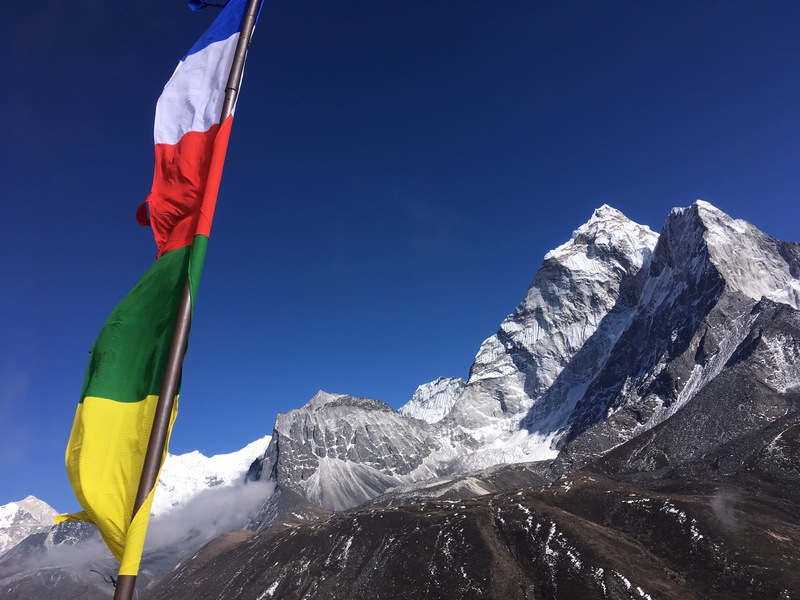 The Himalayas are the land of extremes. 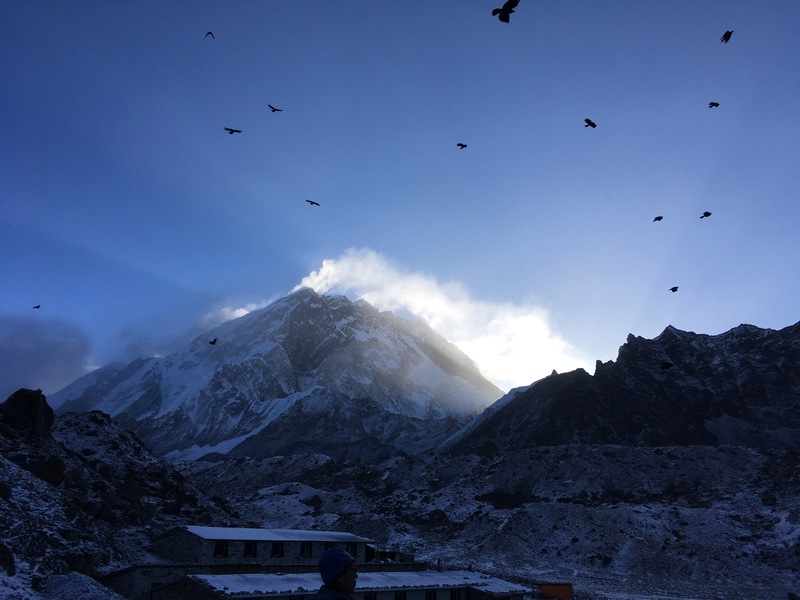 One minute, you are freezing and snow is coming in through the slats in your drafty room and you’re certain you cannot get out of your down sleeping bag. 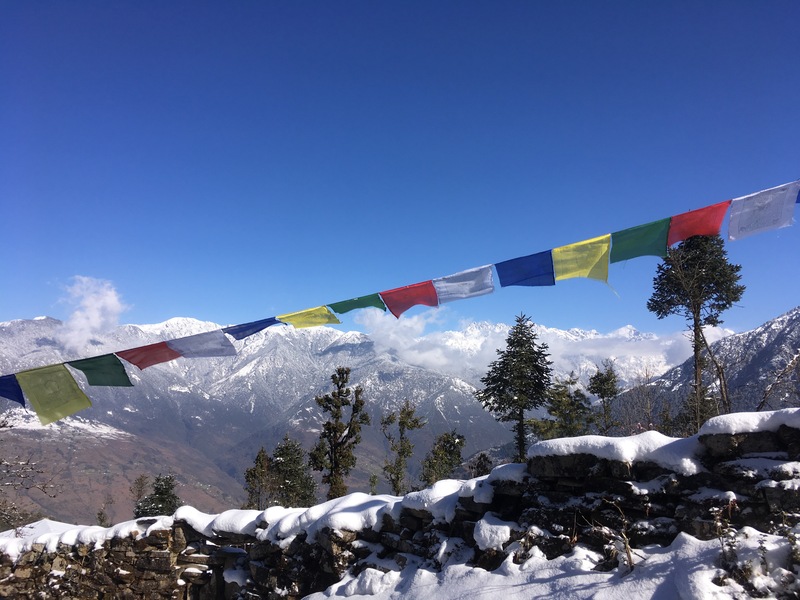 The next, you are standing in a sunlit valley stripping down to your leggings and t-shirt and staring out at a panorama of grey and white mountains higher than any other points in the world. 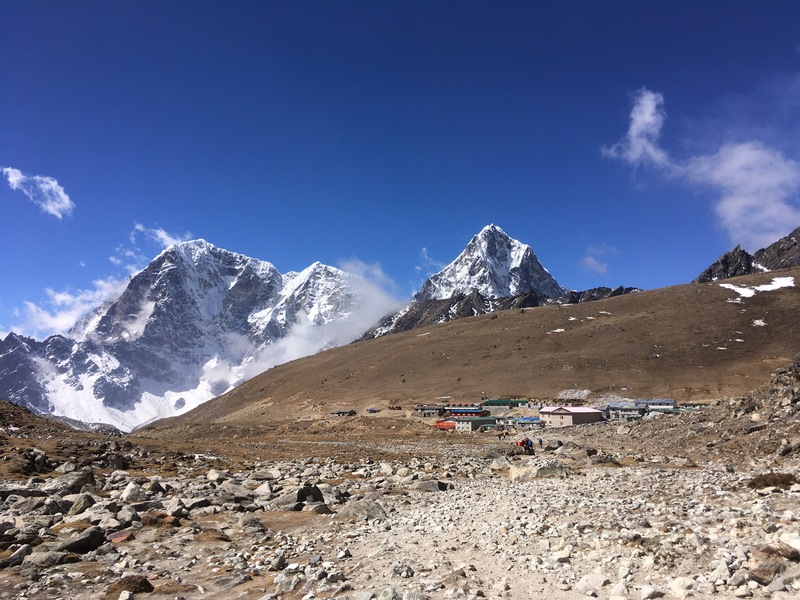 In Dengboche, just slightly higher than Pheriche, we take an acclimatization day. 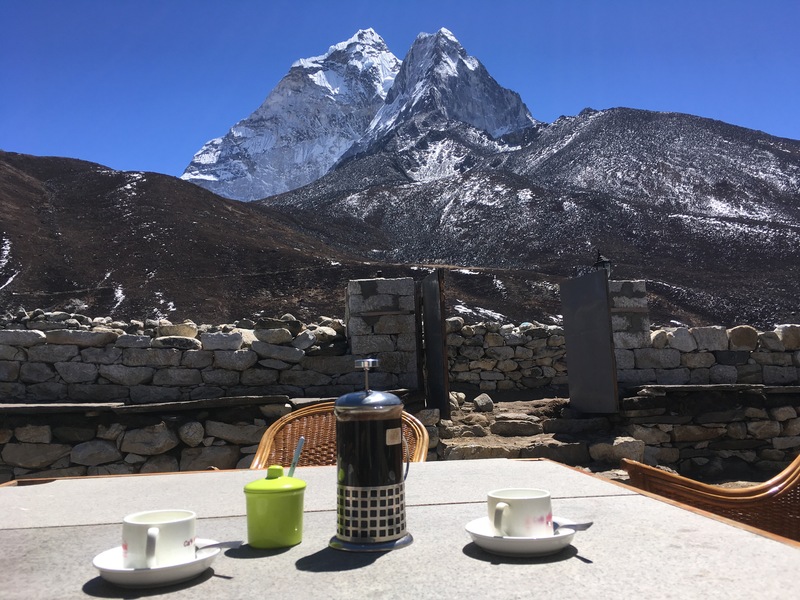 Emma and I find a coffee shop and lounge outside in the hot sun drinking thick black coffee from a glass French press, her sketching the striated mountain of Ama Dablam looming before us, me writing this post. The speakers in the coffee shop alternate between Spanish guitar, tinny Nepali rap songs, a random Christmas carol, and an Adele cover. With each new song, Emma and I laugh. “We need more acclimatization days here,” I joke. “We’ll acclimatize by dehydrating ourselves with black coffee,” laughs Emma. 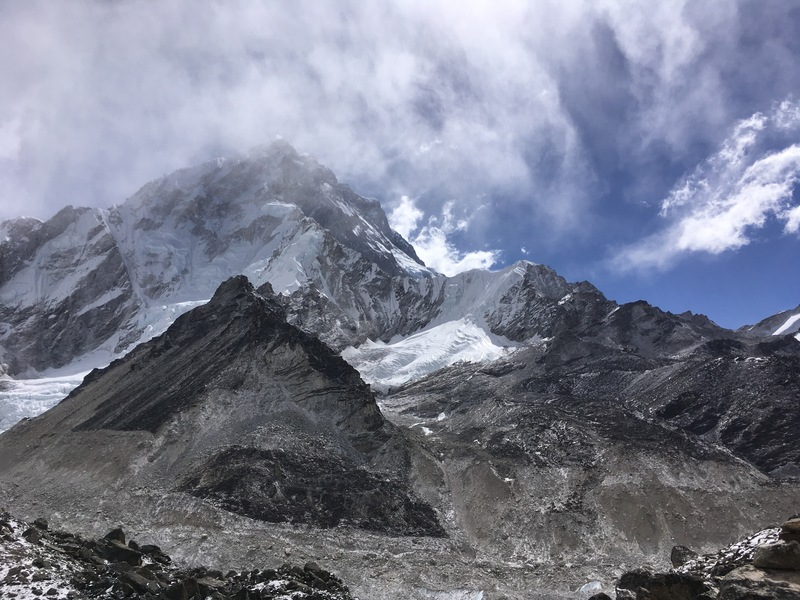 “And not doing any high altitude hikes,” I say. 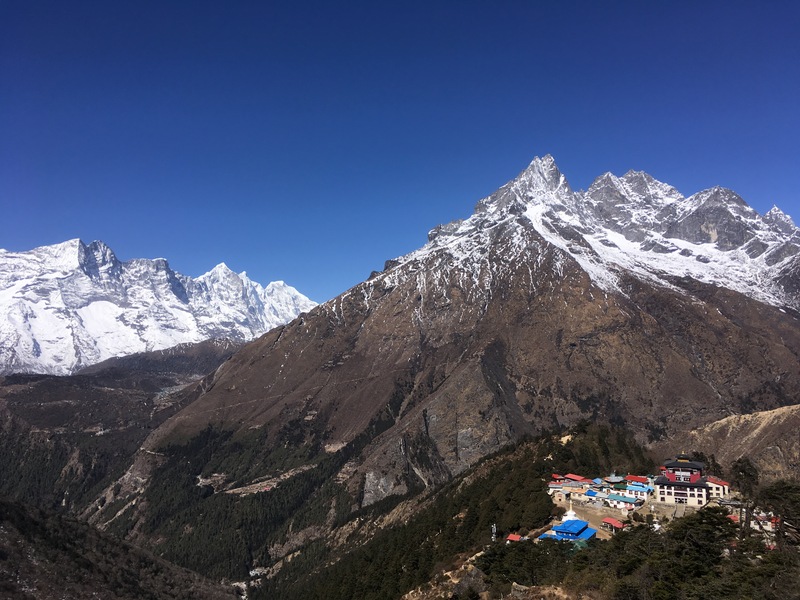 We’ll eat crumbly apple and chocolate and cheese pastries baked in the hot ovens out back and watch the clouds cast shifting shadows upon the steep slopes of Ama Dablam. 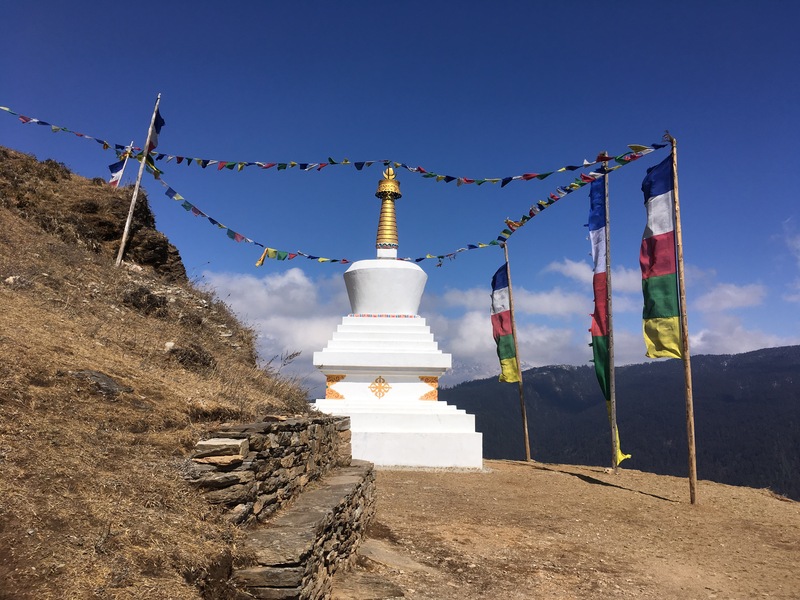 We’ll listen to the caws of ravens swooping past and contemplate existence while staring at a white-based, yellow-topped stupa with the eyes of the Buddha painted in bright blue. 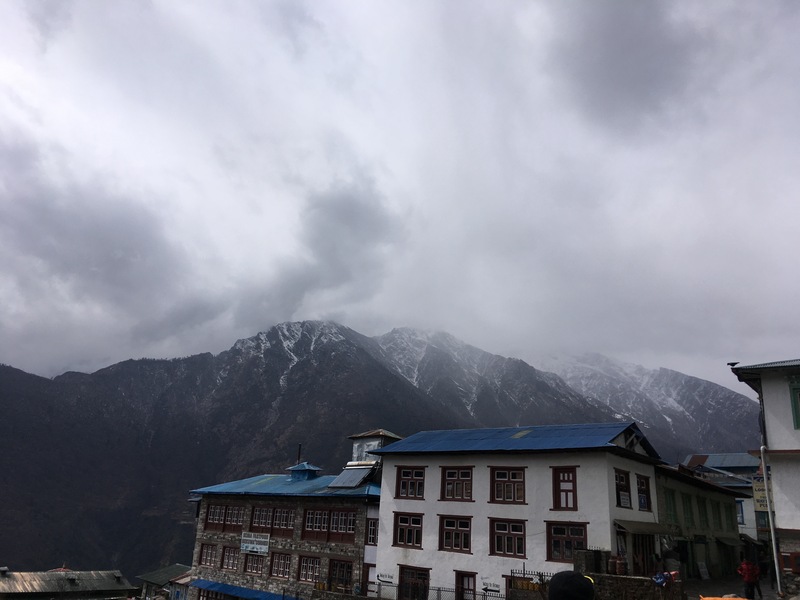 Trekkers pass us, followed by laden-down porters, calling out, “hello!” and “namaste!” A Nepali woman with a baby bundled on her pack walks past, staring at the looming mountains surrounding this small, tumbled-stone town. 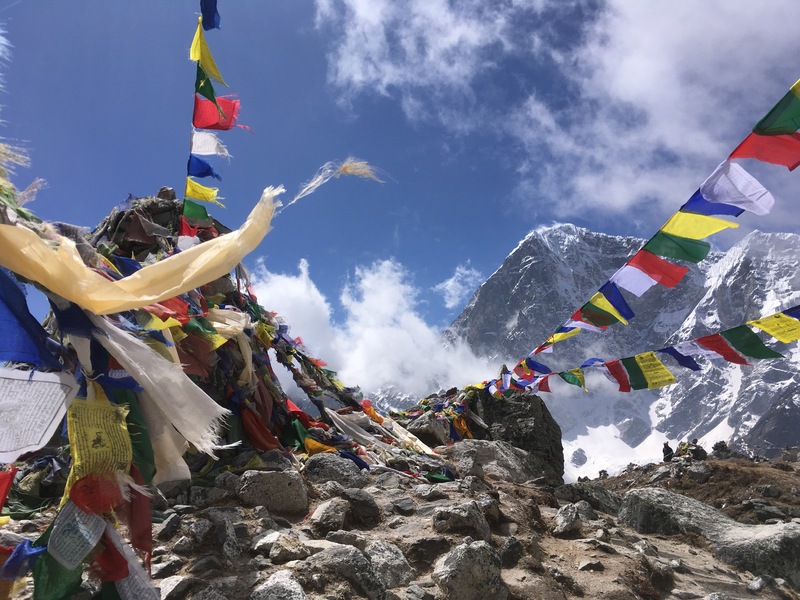 Sitting here at almost 14,300 feet, I take deep, clear breaths, and feel peaceful from the center of my heart out through my whole being. I was prepared for many dangers, mishaps, illnesses, mistakes. 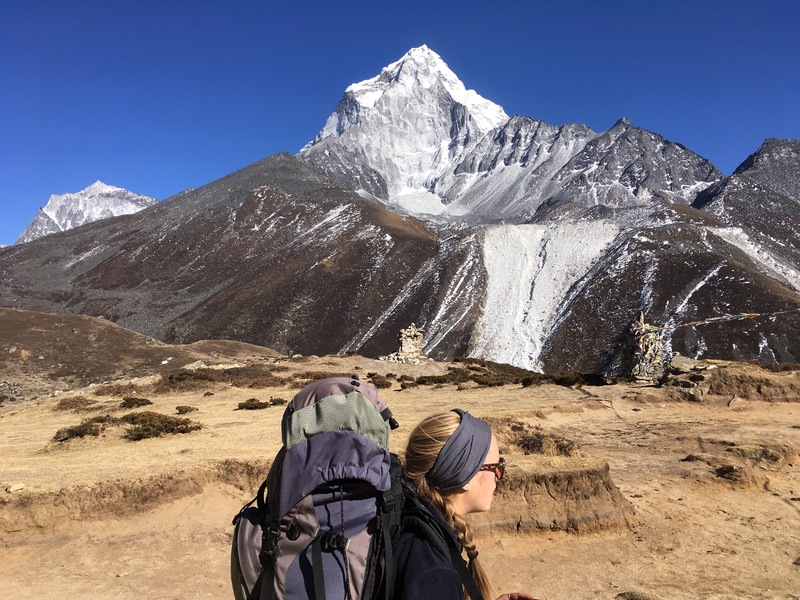 In my pack is Diamox for the altitude, antibiotics for infections, Tylenol for headaches, Imodium for — well, you name it, I’ve got it. But I was not prepared for this. 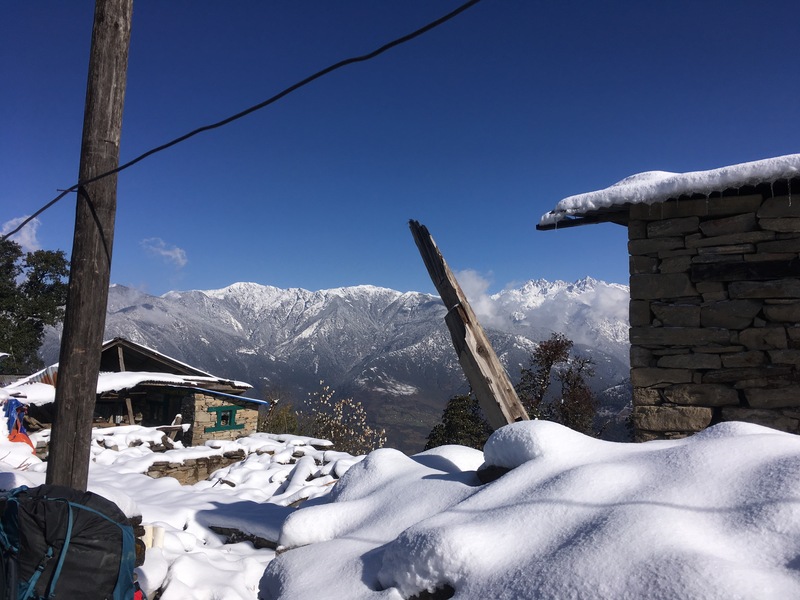 On the fourth day, we leave the hovel owned by the old Nepali couple and ascend the mountain in the snow. 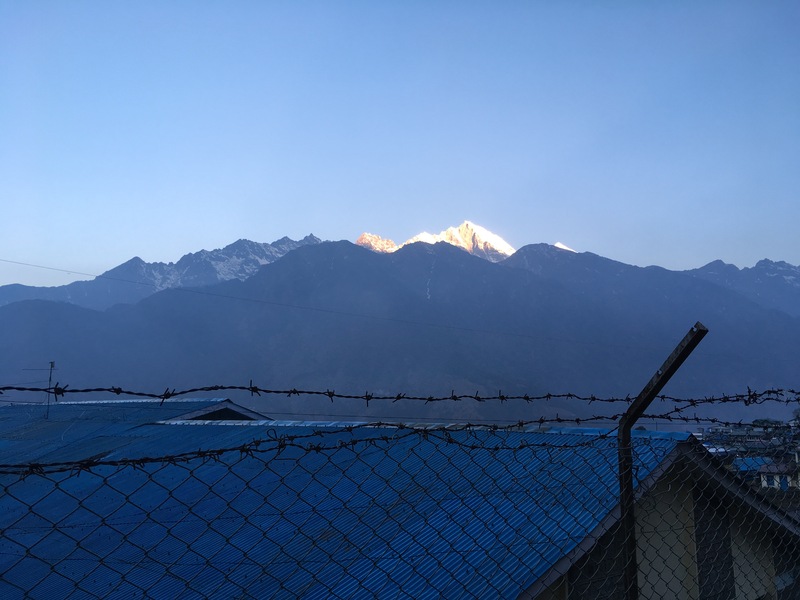 We have slept intermittently the night before, but we are glad to be hiking, glad to have the white wall of the Gaurishankur Mountain Range towering brilliantly against the blue sky to our left. A Nepali sheep dog tags along with us as we climb through the ankle deep snow. He is friendly, and we name him Norgay after the Sherpa who first climbed Everest with Sir Edmund Hillary. 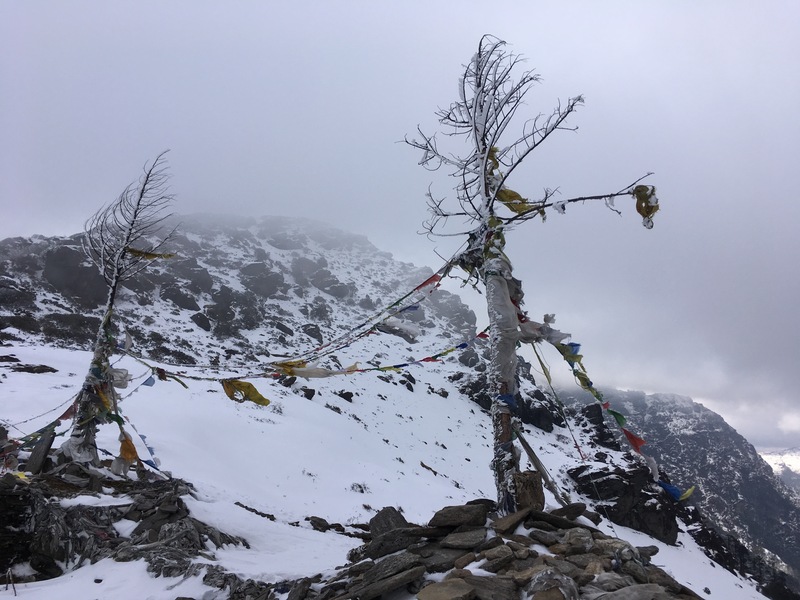 The snow is deeper the farther we climb, and soon, we leave Norgay behind to ascend a steep ridge in knee deep snow toward the Lamajura Pass at around 12,000 feet. 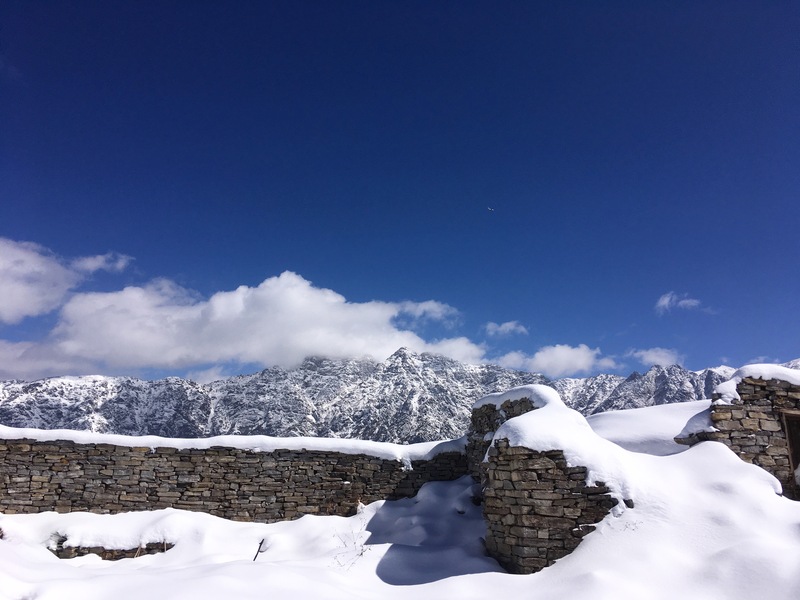 We come across deserted lodges, silent on the mountainside. 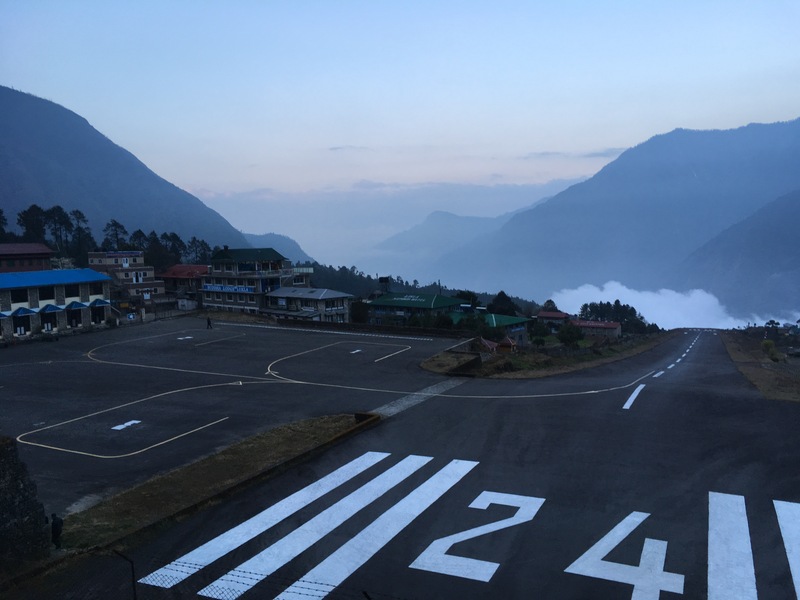 Occasionally, a helicopter from the nearby airport of Lukla soars overheard. 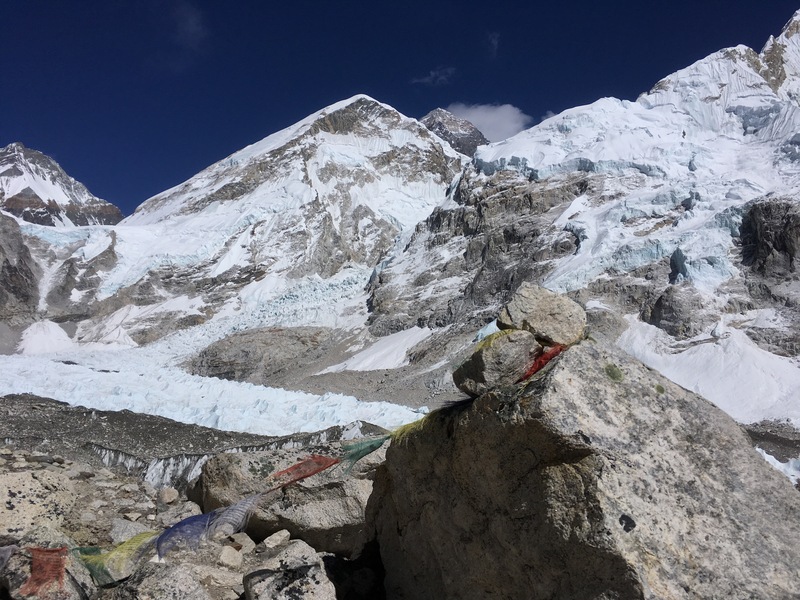 Otherwise, it is quiet but for our labored breathing and the click clank of our trekking poles against the stone. 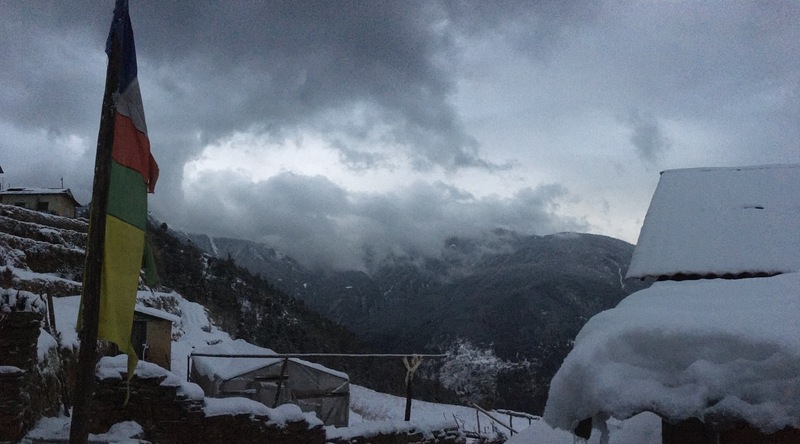 When we reach the pass, dark swirling snow clouds swarm the sky and a harsh sharp wind blasts against us. 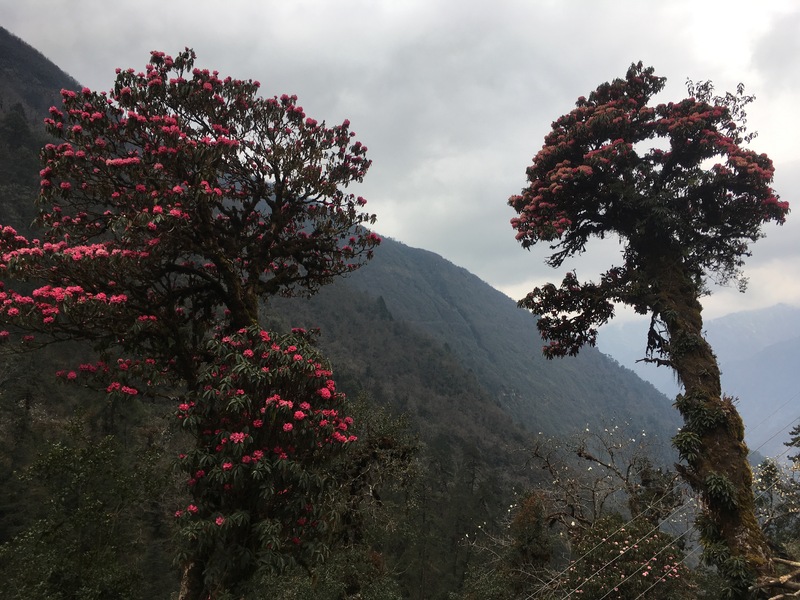 The pass is a V between two mountains, nothing but two dead trees with scraggly limbs strung with tattered prayer flags slapping madly in the wild wind. It is frigid. Later, my friend Emma will call it apocalyptic. 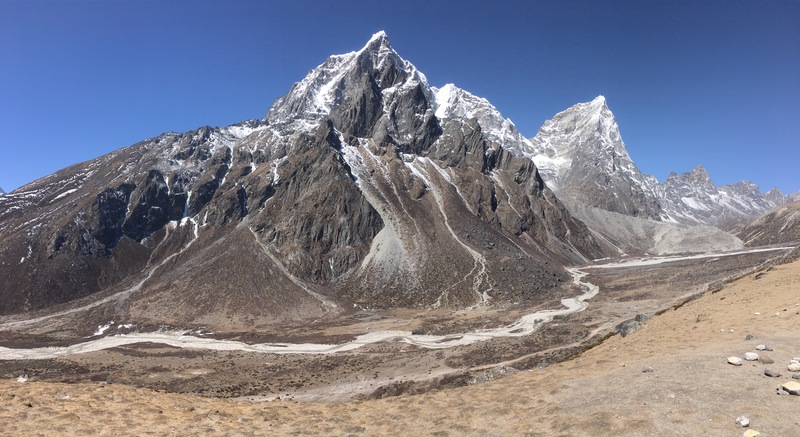 We cross the pass and we all say it is the most intense thing we have ever done. 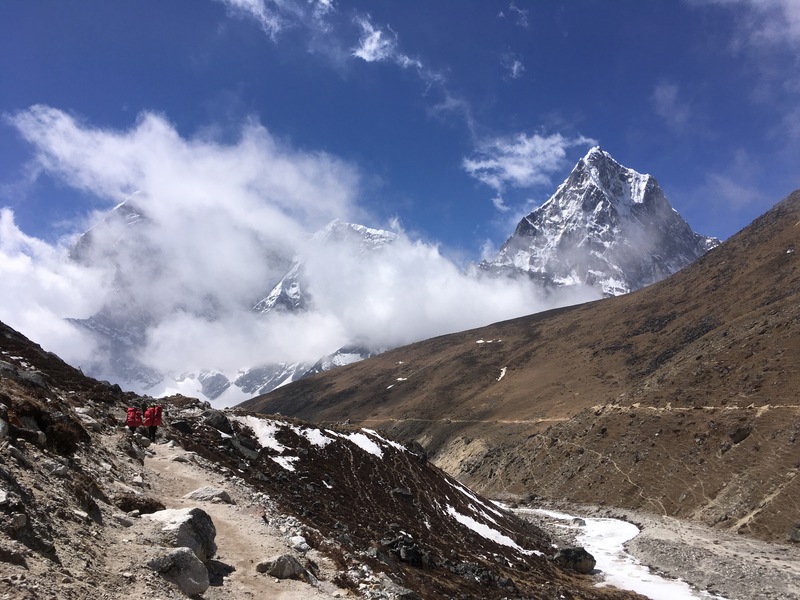 We think we have completed the hard part, but now we must descend the mountain, and this is when my knees begin to pound. Four hours later, we are still hiking, now through thick, squishy slush. I am delirious from lack of sleep. I move so slow, placing one labored foot on the stone after another. 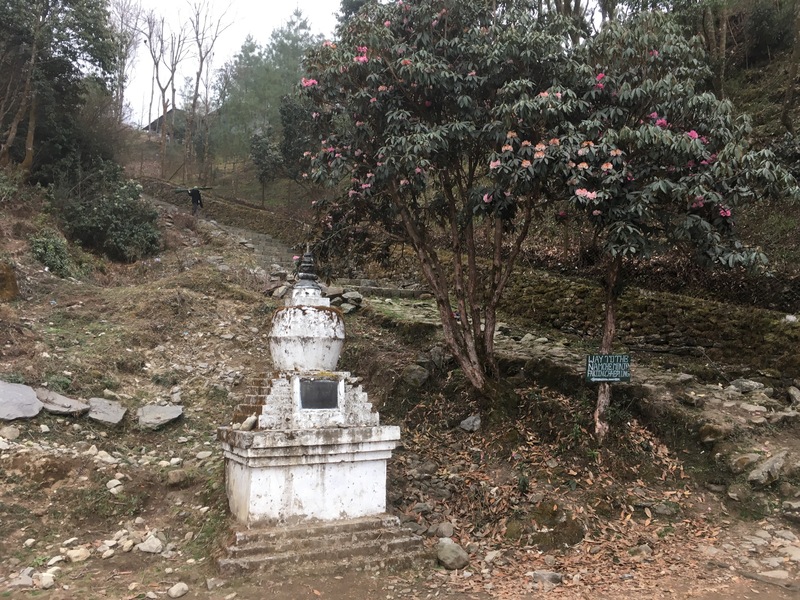 A Nepali family comes skipping down the mountain in nothing but tennis shoes calling out, “Namaste!” before running past a crumbling mani wall. 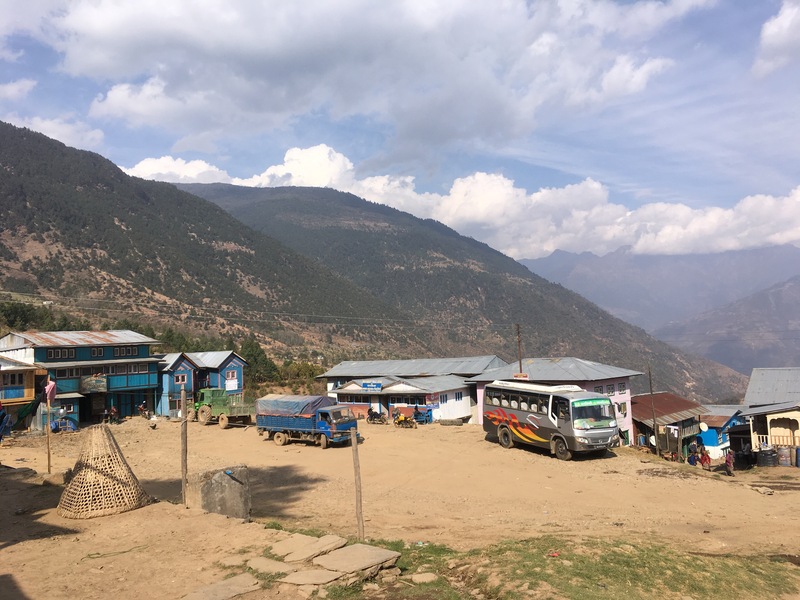 When we finally reach the town of Junbesi, I collapse into the first lodge we find. The little four year old daughter of our host wants to play with Emma and me. She climbs up onto the seat beside us and points at our blonde hair and pats our puffy jackets, but all I can do is smile at her rosy cheeks and sad cough and sip my tea in exhaustion. 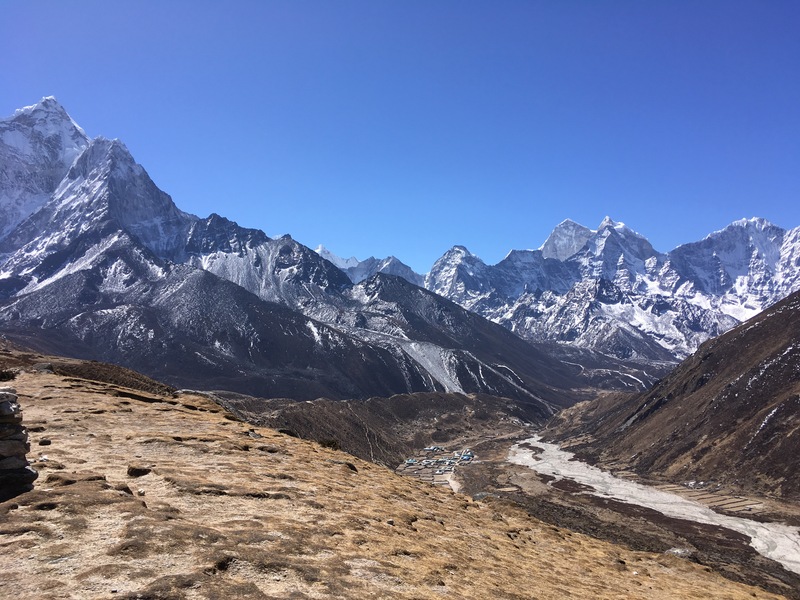 The next day, the hike should be easy, and it is a short, beautiful hike toward the first view of Everest. 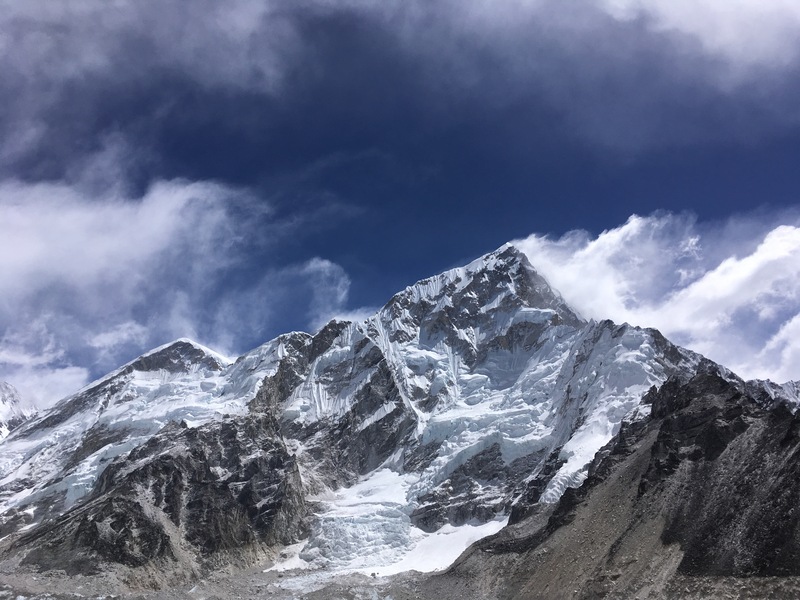 She seems so small to me, but really, it’s amazing that we can still see her behind several other large mountain ranges. 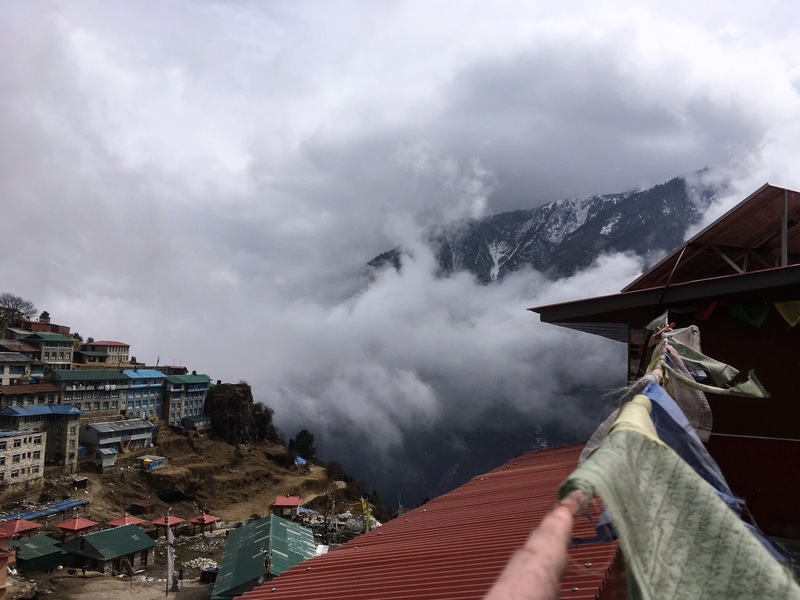 When the clouds clear and she appears, the Nepali man who serves us hot lemon tea points to her and we all cheer. 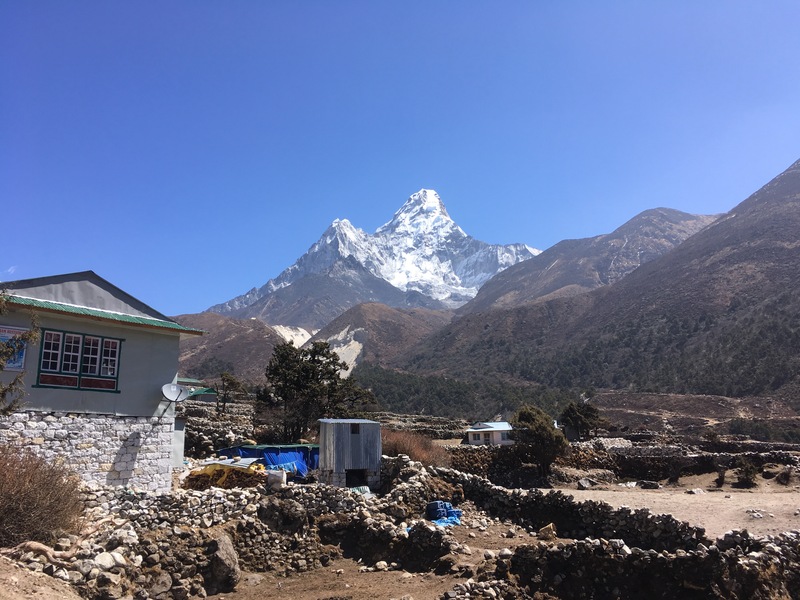 We stay there and drink tea and eat Snickers and marvel: we have now seen Everest, the tallest mountain in the world. 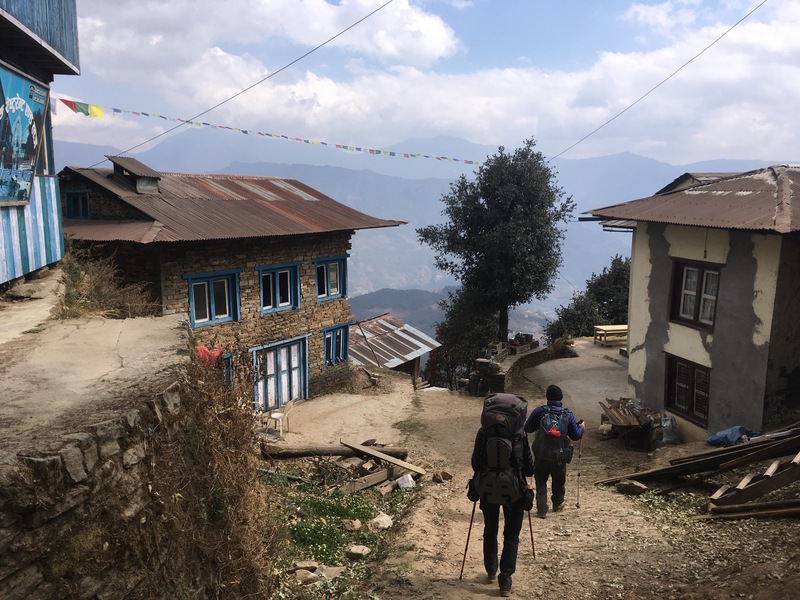 It should be an easy hike to our next tea house in the small village of Ringmu, but an intense throbbing begins in my knees and I must descend slowly, leaning heavily onto my trekking poles as I go. When we reach the lodge, I peel back my wool leggings and gasp: my knees are swollen, red, and sore. The left knee feels as if it will shoot out to the side whenever I walk on it. Of course, our host gives us a room upstairs. I spend the night drifting in and out of fitfull dreams, wondering, praying that my knees will heal in the morning. How isolated I feel, several days walk from the nearest pharmacy. How guilty I know I will feel if we cannot go on tomorrow or the next day because of my knees. In the morning, I am moderately relieved. 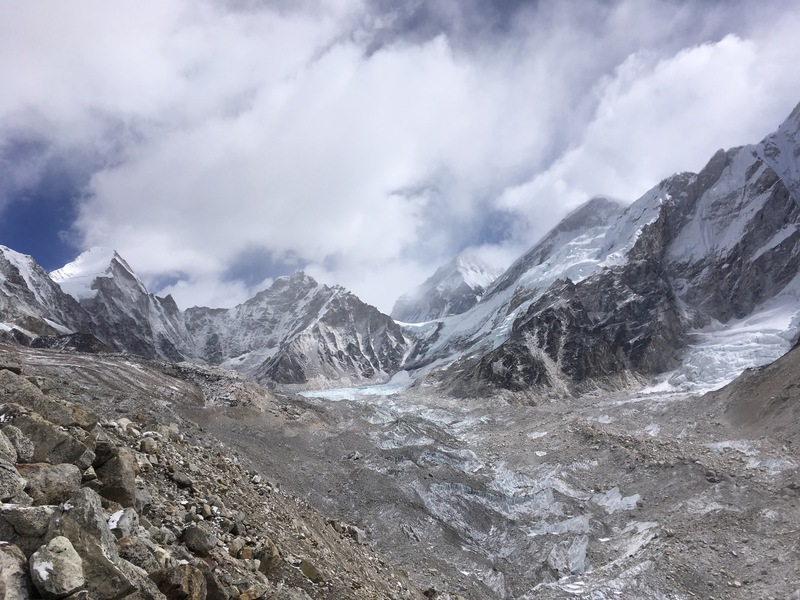 The knees are less swollen, and we make the decision: with bandages wrapping my knees tight and menthol patches to keep them cool, we will go on, slowly. As Emma wraps my knees with the bandages from hers and our German friend Niels’ first aid kits, I tell her about my dreams in the night. I tell her that now, I am 25 and healthy, and I have reason to hope my knees will heal tomorrow or the next day. I am also a Westerner, so if my knees do not heal tomorrow or the next day, someone will come for me, I can return to the U.S. and get the advanced medical treatment I need. But what about the time, years from now, when my knees do not heal tomorrow or the next day? 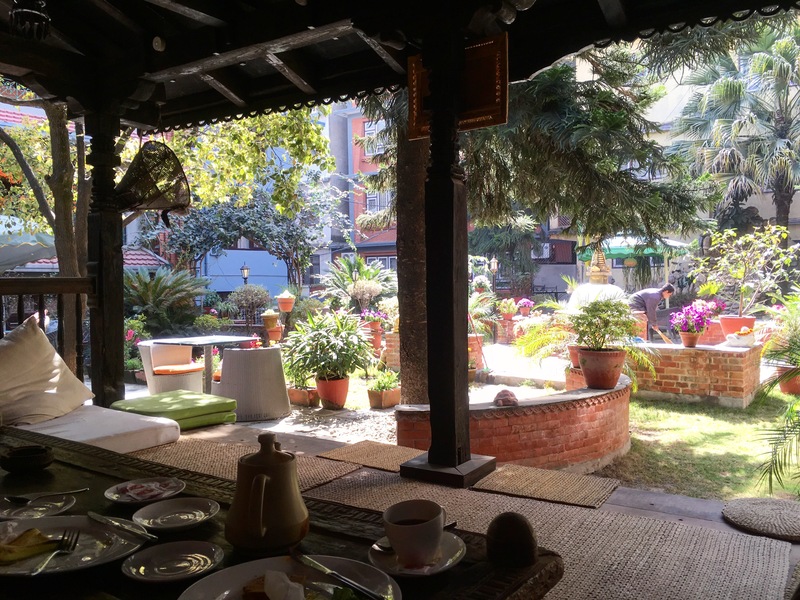 What about my Nepali host downstairs who relies on her knees for her work, and does not have advanced medical treatment to heal them should they be injured tomorrow or the next day? There is always a limit to our physical prowess; we in the West simply extend it the best we can. I think about Jesus who said, now you walk where you wish, but a day will come when others will lead you, and maybe where you do not want to go. “It is morbid!” Emma agrees. 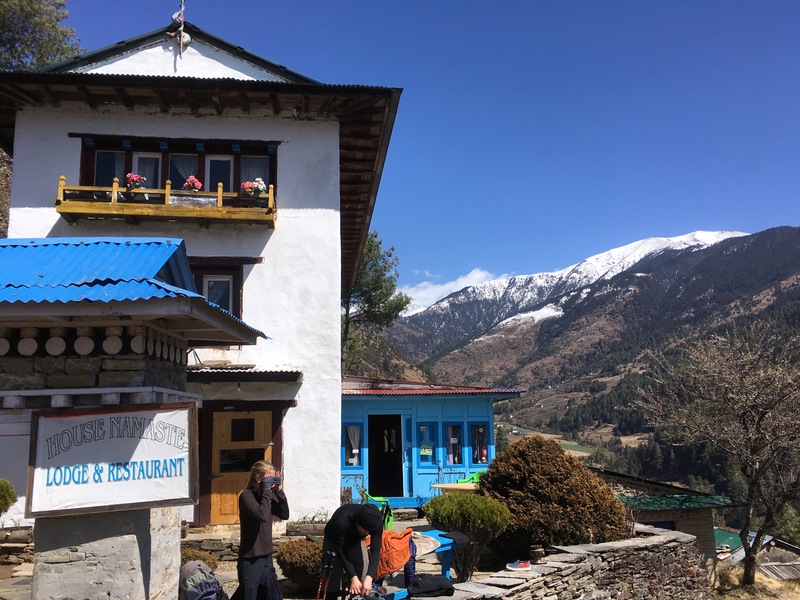 That day, we walk to the town of Nunthala, where Niels runs ahead to order us vegetable chow mein, beer, and Snickers at a yellow and blue painted lodge on the side of a cliff. The next day, my knees are less swollen. 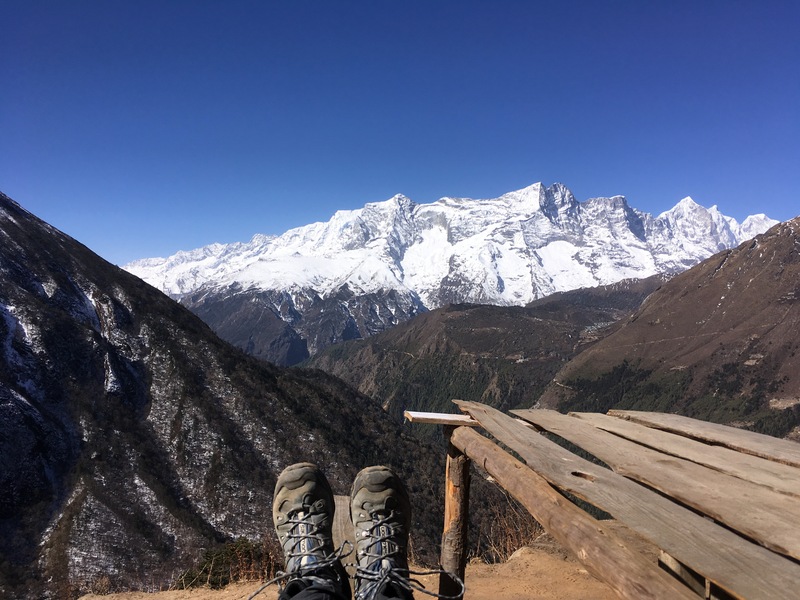 Two days later, I buy knee braces at a pharmacy in Lukla, wonder if I need them at all, and we walk on. 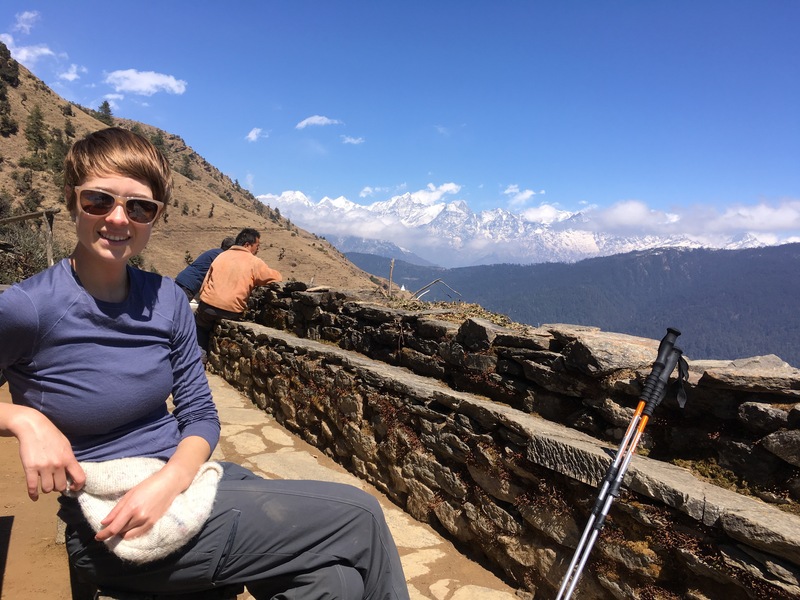 You are currently browsing entries tagged with trekking at elizabeth hamilton.